If you have a dog, then you know why they are often referred to as man’s best friend, and that really is an under statement. It really should be a human’s best friend because your pooch keeps a watchful eye over the entire family. Moving with your dog can be a challenge, but it all really depends on the dog. If you have a properly trained dog, and your dog sees you as the pack leader, then moving with your pooch will be fun. On the other hand, if your dog is a little on the wild side, and he or she has more control over you, then moving will be tough. Here are some tips that will making moving with your dog a lot easier, regardless of what kind of dog you have. Your dog has taken care of you its whole. It has kept a watchful eye over you and your family. It has never asked any questions. It just does its job. Now it is your turn to return the favor. To make moving with your dog easier, you have to keep your dog comfortable at all times. This is easy enough to do. Make sure that you have plenty of food for your dog during the move. The move may or may not make your dog a little anxious. If your dog does get anxious, they will most likely ignore food, but you should have some with you anyways. Treats work even better. Make sure that you have plenty of water too. Your dog won’t be able to tell you that it is thirsty. If you have plenty of water available, then there won’t be any problems. Make a nice comfortable spot in your vehicle for you dog to lay down while you are driving. If it is going to be a long drive, make sure that you take plenty of breaks so that your dog can eat, drink, and go to the bathroom. If your dog requires regular medication, make sure that you have plenty on hand at all times. If your dog is a little on the wild side, you may need to make a visit to your vet and have them prescribe you some mild tranquilizers for the dog. You may also need to use a muzzle on your dog if it is a little bit wilder. Your vet will be able to give you what you need, and they will also be able to tell you the best way to use the medication. This can make the driving part of the move a lot simpler. 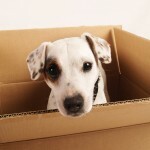 There is one other really simple way to keep your dog comfortable during the move. Talk to it. Pet it. Tell your dog that everything is going to be just fine. It is amazing how much of an affect this can have on your dog. As long as your pooch is happy, then everything will be just fine during the move.